The cabinet pull shown here features a very decorative design. Measures 5 1/4 inches overall with a 3 3/4 inch center to center mounting distance. The finish is a Matte Pewter and each of these pulls come with the mounting screws. 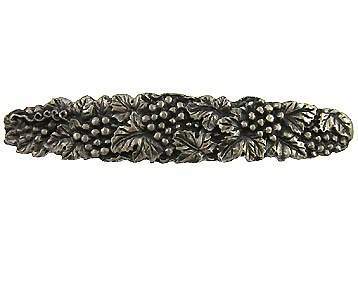 These Grapes and Vines style pulls are hand cast in solid pewter. A matching knob is also available. The Matte Pewter finish coordinates well with Stainless Steel, Granites and Hardwoods.